When the Phillies made a somewhat surprising trade for Clay Buchholz in December, two of their top pitching prospects that showed flashes of success in brief big league auditions last summer moved back down the depth chart. Zach Eflin, coming off two knee surgeries, was set to start the 2017 season in Allentown. Joining him in the Lehigh Valley IronPigs rotation would be fellow right-hander Jake Thompson. Both have remained in Allentown for the majority of 2017 despite regular openings in the rotation. Eflin (right elbow) has continued to battle injury woes and Thompson has struggled to find consistency in his second full season at Triple-A. The 23-year-old Thompson returned to the big league roster on Tuesday, but it’s likely just for a couple of days. Following Monday’s nearly-two-hour rain delay, Ricardo Pinto was optioned to Triple-A and Thompson, who had been scheduled to start for the IronPigs on Tuesday, joined the major league bullpen to give Pete Mackanin a fresh arm. After going 11-5 with a 2.50 ERA in 21 starts with the Pigs last season, Thompson is 4-11 with a 5.36 ERA this season at Triple-A. Two years after coming over in the Cole Hamels’ trade and nearly a year after making his big league debut as the unanimous No.1 pitching prospect in the Phillies farm system (according to Baseball America, Baseball Prospectus, and MLB.com), Thompson has been passed over by the likes of Nick Pivetta and Ben Lively and has become a mostly forgotten-about prospect. Thompson’s name was nowhere to be found in any of those aforementioned publication’s recent midseason prospect rankings (or ours’ either, to be fair), although he also doesn’t qualify according to MLB.com's guidelines after pitching at least 50 innings in the big leagues last season. Perhaps Thompson has already turned the proverbial corner in Allentown and can finish strong in the final six weeks of the minor league season. He has a 3.33 ERA in four starts in July and has held hitters to a .220/.297/.374 slash line in those games (although neither his 11 strikeouts or nine walks in 24 1/3 innings in July are ideal). Perhaps Thompson is no different than one of only two guys ranked ahead of him on any Phillies prospect list when the 2016 season began. The 6-4 Texan was ranked third on both Baseball America and Baseball Prospectus’s preseason lists entering ’16, behind shortstop J.P. Crawford and current Phillies outfielder Nick Williams. Like Thompson, Crawford has had a largely disappointing second season at Triple-A (.228/.333/.369 in 87 games). But the 22-year-old Crawford entered Tuesday hitting .290 with six home runs, eight doubles, and four triples in his last 32 games. Jake Thompson had a 2.50 ERA in 21 starts in Triple-A in 2016. In 2017, he's more than doubled that number in 18 starts. Sometimes the best thing that can happen to a top prospect – and for talent evaluators interested in seeing young players’ mental tools as well as their physical ones – is for them to endure a lengthy period of failure. Williams, who turns 24 in six weeks and who also came over in the Hamels’ trade, could probably attest to the importance of learning from failure, too. “It’s definitely been a good learning experience,” Thompson said. “This is the first time in my career that I’ve really struggled for the better part of a season. I think in the long run it’s going to be good for me. Learning how to fail and having to get back up and succeeding again. After making his big league debut last August, just six months after his 22nd birthday, Thompson has almost done the equivalent of going back to grad school after taking his first full-time job. 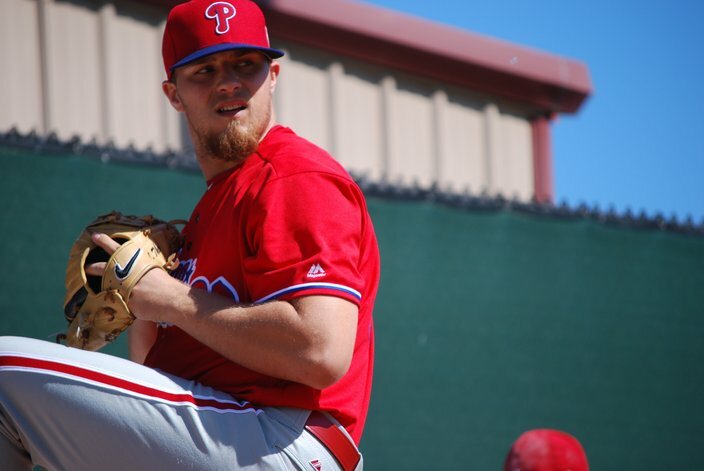 He’s not sulking at Triple-A; he’s learning and eager to continue to see if the lessons will pay off as he attempts to jump back onto the Phillies’ rotation radar. At 23-years-old, Thompson is a year younger than Pivetta and two years younger than Lively. He still has time to blossom, even if the 2017 season hasn’t been what he’d hoped. Like the PhillyVoice Sports page on Facebook.